Mr Mayank Barjatya is a bio-architect with a professional and research background in architecture, human energetics, vastushastra and environment. Along with this, he also has a deep interest in metaphysical studies. Mayank has 20 years of experience in the field and he often travels internationally for various projects. When the spiritual research team had contacted Mayank earlier, his interest was piqued on hearing about the various unexplained phenomena such as spontaneous blood stains, spontaneous combustion and Divine particles at the Spiritual Research Centre. 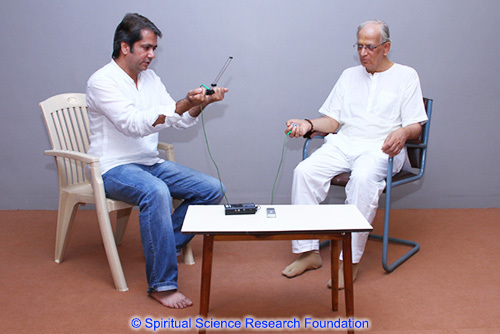 On 13 Jun 2014, Mayank paid the Spiritual Research Centre a two-day visit in order to conduct some preliminary research on the premises along with the spiritual research team. Using a number of instruments which included a Lecher Antenna and other EMF and Geopathic measuring devices, Mayank found that the ashram was highly energised and different when compared to other normal premises. An experiment was conducted on a sample size of 26 which included seekers and Saints using the Lecher Antenna. When this instrument is used on people it measures the subtle vibrations of the top, middle and lower chakras. The top (throat and upwards) is related to cosmic energies and pertains to aspects such as Spirituality, learning ability, power of concentration and creativity. The middle (throat to the navel) is related to the emotions of the person and also to the health of vital organs in that area. The bottom section (navel to feet) signifying Earth and Telluric energies is related to the physical body along with financial strength, professional success etc. The scale of measurement in each of the 3 sections is plus to minus 3. + 3 means the best functioning of the section while -3 means the section is badly affected or diminished in some form or the other. Generally when people are measured by the Lecher Antenna the readings are around plus 1.5. However in the sample of 26 seekers, that Mayank measured in the ashram premises over 75% of the readings were in in the range of 2 to 3 or -2 to -3. All Saints were over 2.6 for the Cosmic or top section. His Holiness Saurabh Joshi is a 18 year old Saint who suffers from cerebral palsy (see picture below). His Cosmic or top section showed a reading of plus 3 which is the maximum. 1. The room 324 is used as a spiritual healing room as it was at one point in time used as a temporary residence by His Holiness Dr Athavale. Mayank noted that the room had a self-regenerating ability. Even though some of the seekers who were possessed by negative energies and were doing spiritual healing there had spread a lot of negative vibrations in the room, by morning the room was showing reading of +20,000. This is very unusual as generally rooms tend to retain such vibrations for a longer period of time. The Bovis scale, named after French radiesthesist André Bovis is a concept used by dowsers and adherents of geomancy to quantify the strength of a postulated “cosmo-telluric energy” inherent in a location. Readings from normal positive rooms range from 8000-10000 bovis. Numbers above 10,000 are in the “ethereal range” and are considered ‘places of power’. 2. The bed used by His Holiness Bhaktaraj Maharaj that was placed in room 324 gave a reading of +30,000 which is unusually high. His Holiness Dr Athavale’s room also gave a reading of +26,000 even though it is always the centre of an intense subtle-battle where higher level negative energies are always trying to attack Him. Also this reading was despite of His Holiness Dr Athavale’s room being located very close to high tension electrical wires. Then Mayank used the Esmog Spion instrument (which measures electro-stress) on the wall where the faces had appeared. He was surprised to find it produced a high pitched whistling sound that was not familiar to him. 4. Generally plastic gives out no vibrations and the Lecher Antenna does not provide any response to plastic. However when the mug and bucket used by His Holiness Dr Athavale were measured, the Lecher Antenna recorded cosmic readings of +18,000 and +7800 respectively. 5. Another interesting fact is that there are very few things which the Lecher Antenna cannot pick up vibrations from. However when Mayank tried to measure the vibrations from a sample of Divine particles which are non-metallic, the Lecher Antenna could not perceive any vibrations. We will be conducting spiritual research to understand why this is so. Mayank has expressed interest in taking time out from his busy schedule to conduct a few more research projects to understand the effect of the highly energised environment of the Spiritual Research Centre on a person and vice versa. SSRF would like to extend an invitation to all scientists and researchers to help us understand the unexplained phenomena in the ashram. Respected sir /madam have a good day first I m thankful to SSRF very nice platform fight with negative energies. I feel most time attack negative energy on me and my daily life works financial etc ,I give you example I want sell my flat last one year its cheap also buyers contact me and some buyers OK deal with me but after some time they don’t buy and if I do more chanting and other positive works just at time ringing on my mobile yes I want buy . the second thing is every Sunday is my unlucky Sunday my all works stop on Sunday health and wealth etc if Sunday come in advance I said my self oh God its unlucky day come in mah life . 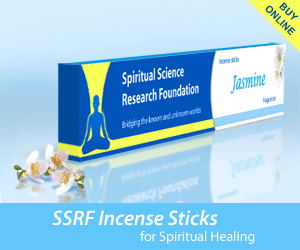 I m very thankful to SSRF . You can consider doing spiritual healing remedy of saltwater and box remedy that helps remove the build up of black covering around the body. Namaste, I am regular reader of your website. Please update the Mr Mayank Barjatya link, it seems to have changed. We are glad to hear you are reading our site regularly, we hope you are benefiting from it. Gratitude for bringing this issue to our notice, we will look into it as soon as possible. Wishing you a blissful day ahead! I would like to be aware of the existence of spirits because I am a spirit being …. When someone grows spiritually, then one becomes more sensitive about spiritual dimension and also more understanding comes how we are influenced by it. Spiritual growth can happen through regular spiritual practice. It would be nice if you can explain your question in a bit more details so we can answer you more precisely. The best would be through our login facility. 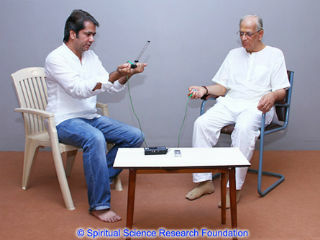 I have been reading the articles of SSRF since 2009.I have suggession that spiritual articles should also be published on Whatsapp as it will be benficial to many people who are not aware or for those who do not believe in ghost,demons,negative entities etc.Whatsapp is fastly spreading in india.There should be an ssrfwhatsapp group similar to skype.People can chat spiritual experience,seek advice regarding spiritual matter,share videos to a whole group more easily. I agree, we need it, this is the high time now. I’m so glad these experiments are done because doubting Thomases like me can feel reassured and that we are not fools following some kind of crazy organisation, but there are spirits and we need to be aware of this phenomenon.